A cling rubber stamp from Stamping Bella featuring a Mother & Daughter, and the sentiments "Just Right", and "Rainbow Chaser". Cling stamp from Carabelle Studio featuring the sentiments "100% Relaxed, 100% Happy", and "Keep Calm". Hero Arts rubber stamps featuring the sentiments "This is where I want to be", "We are explorers", and "In my happy place". Hero Arts woodblock stamps originate from sustainably managed forests. They are hand-cut and assembled in the USA. Each design is an imaginative original, and a lasting keepsake. Impression Obsession clear stamps featuring the sentiments "You are mine", "Breathe", "Bloom", "Peace", "Be Brave", "Live", "Kindness", "It will be okay", "Courage", "True Love", and more. This is a clear photopolymer stamp set measuring 4 x 4 inches. Impression Obsession clear stamps are made in the USA from the highest quality photopolymer. Clear stamps featuring the sentiments "Always Be Kind", "Forever Grateful", "So Blessed", and "Thank you for your kindness so tender". MSE - My Sentiments Exactly Clear Stamps. For all words you want to clearly stamp! Clear rubber stamps are economical, easy to position and store compactly. Artist Laurel Burch strove to create images that would remind people of the ongoing world of the spirit. Magical, beautiful images that will give you the freedom of expression to color and enjoy. 14 pieces. Large flower measures approximately 2.25" X 2". This Large 4" X 6" set of Perfectly Clear Stamps features premium photopolymer images from exclusive artwork copyright Laurel Burch. Interactive images work together for dozens of fun looks. Use with acrylic handle sold separately. Made in the USA. Artist Laurel Burch strove to create images that would remind people of the ongoing world of the spirit. Magical, beautiful images that will give you the freedom of expression to color and enjoy. This original design is copyright Laurel Burch. This Large 4" X 6" set of Perfectly Clear Stamps features premium photopolymer images from exclusive artwork copyright Laurel Burch. Interactive images work together for dozens of fun looks. Use with acrylic handle sold separately. Made in the USA. 14 pieces. Ignite your creativity and enhance your volcanic scenes with this collection of sentiments. The fun font and punny phrases will complement your cards perfectly for an explosively wide range of occasions. This 11 piece set includes sentiments ranging from 1/4" (Pull) to 3 1/8" (I'll love you 'til the end of time) in length. Clear stamp sets include the name of the set on the sticker for easy identification. Our clear stamps and Die-namics are made in the USA. A 4"x8" set of clear stamps, made of the highest quality, non-yellowing polymer. This stamp set features 22 stamps, including a row of tickets, and some mix-n-match sentiments that are perfect for carnival, carousel, circus, and roller coaster themed cards. Approx. sizes: Enjoy The Ride: 2" x 1", Row of 3 tickets: 4.5" x 0.75", You make me loopy: 1.625" x 0.625"
"Life is art. Paint your dreams, sing your songs, enjoy the dance". This quality cling-mount rubber stamp is made from deeply etched, precision trimmed premium grey rubber. With 1/8" thick grey foam for a smooth impression on uneven or textured surfaces, it is backed with a full sized, indexed sheet of acrylic cling vinyl. The index allows for precise placement of the image when used with a clear acrylic handle. The image features original artwork designed by Fran Seiford. Image size is approximately 4 3/4" x 1 3/4". Cling stamp from Carabelle Studio featuring the sentiment "The sound of your voice is my favorite music". Impression Obsession cling stamp featuring the sentiment "Livin' the Dream". 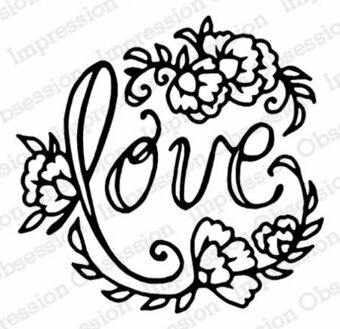 Cling stamp from Impression Obsession featuring the word "Love". Perfect sentiments for your Valentines or any time. 18 stamps. 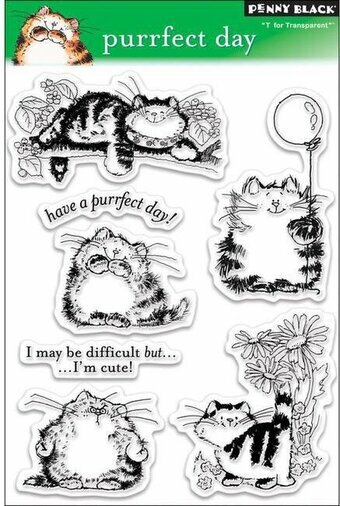 This Large 4" X 6" set of Perfectly Clear Stamps features premium photopolymer images from exclusive artwork Fran Seiford. Interactive images work together for dozens of fun looks. Use with acrylic handle sold separately. Love themed Hero Arts wood mounted rubber stamp featuring the sentiment "Love You Message". Hero Arts woodblock stamps originate from sustainably managed forests. They are hand-cut and assembled by Hero Arts in the USA. Each design is an imaginative original, and a lasting keepsake. Cling Stamp from Impression Obsession featuring the humorous sentiment "I Love You More Than Chocolate Cake". A set of clear stamps from Lawn Fawn, including the sentiments "I love you to the stars and back", "Reach for the stars", "You shine", "You're a star", and "I thank my lucky stars for you". Clear Stamps featuring Aladdin's Lamp, a Genie, diamonds, "Make A Wish", "Shimmer and Shine", "Believe", "You shine bright like a diamond", and more. Hero Arts 4″x6″ clear stamp sets offer the best quality in the market. They are made in the USA from genuine photopolymer, which is non-toxic, biodegradable, and designed specifically to transfer ink to paper for a true impression every time. Peel off your stamp from its backing and stick to an acrylic block for easy positioning. Mix and match the designs, then clean with water or stamp cleaner. 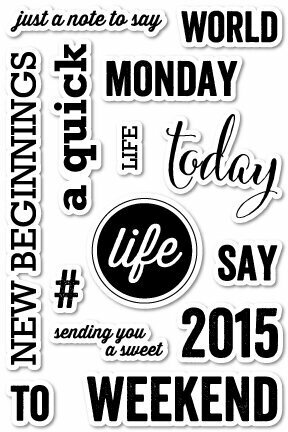 Clear stamps from Memory Box featuring the phrases "Weekend", "Monday", "2015", "World", "New Beginnings", and more. 4 x 6 inch stamp set. 11.4 x 14.2 centimeter stamp set, 14 stamps. This follow-up to the previous Monster Love collection includes a brand-new batch of adorable, smile-inducing creatures. The 2-step style will allow you to create multicolored monsters complete with contrasting eyes, mouths, and in some case, antennae. The quirky sentiments coordinate fit the style of characters perfectly. This 21 piece set includes: Monsters (6) 1 1/8" x 1 3/4", 1 1/4" x 1 3/4", 1" x 1 5/8", 1 5/8" x 1 1/2", 1 3/8" x 1 1/2", 1 5/8" x 1 3/4", Stars (3) 1/4", 5/16", 5/16", Sentiments (6) ranging from 1 1/4" x 1/2" (hooray for you) to 2 5/8" x 1/2" (you're my favorite human). Clear stamp sets include the name of the set on the sticker for easy identification. Our clear stamps and Die-namics are made in the USA. MSE - My Sentiments Exactly wood mounted rubber stamp featuring the humorous sentiment "I love you more than my coffee, but don't make me prove it". Cling Stamp from Impression Obsession featuring the humorous sentiment "You are worth so much more than your mess." This hand lettered stamp is perfect for a friend or the love of your life! It is sized just right to be the focal point of a project or to fill a journaling card. It is sure to become one of your most favorites! Clear stamps from Hero Arts featuring stamps for "Yesterday", "Today", "Tomorrow", "Time", "Place", "Day", "Week", "Note", "Weather", and more. Hero Arts clear design stamps peel off their backing and stick to acrylic blocks for easy positioning. Mix and match the designs, then easily store them for another time. Made by us in the USA from genuine photopolymer. Unmatched quality means a crisp impression every time. MSE - My Sentiments Exactly wood mounted rubber stamp featuring the sentiment "There is a way that nature speaks". 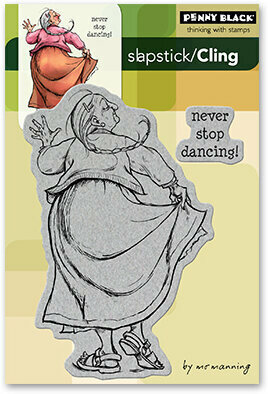 A Penny Black Slapstick Cling Stamp with an inspirational message to "Never Stop Dancing!" Clear Stamp from Impression Obsession featuring the inspirational sentiment "if you are always trying to be normal, you will never know how amazing you can be." Cling Stamp from Impression Obsession featuring the sentiment "Not a creature was stirring... ok, maybe a Mouse". Come along for a visit to the homestead of one of the furry tailed inhabitants found in Oakberry Lane! Create whimsical woodland scenes with a substantially sized acorn cottage homestead stamp, adorn cards and scrapbook layouts with smaller hand stamped acorn accents, and finish off with the perfect sentiment to complete your handmade paper craft projects! The ideal illustrations to set friends and loved ones chattering about your artistic coloring skills! Approximate Image Sizes: 1. Cottage: 4.25" x 4.5", 2. Acorn Accent: 1.0" x 1.25", 3. Life is Better Sentiment: 2.0" x 1.0", 4. Nuts About You Sentiment: 2.0" x 0.5", 5. Speedy Recovery Sentiment: 2.75" x 0.75", 6. Thinking of You Sentiment: 2.5" x 0.75". These cling stamps are ready to use with Acrylic Blocks. Included with stamp set: 1. Storage panel for use with a two or three ring binder, 2. Stamp packaging can also be used as a storage box for the stamp(s). Love themed Cling Stamp from Stamping Bella featuring the sentiment "You hold the key to my heart". A cling rubber stamp from Stamping Bella featuring a Mother & Daughter, and the sentiments "Often True", and "Master of Giddy". Cling Stamp from Impression Obsession featuring the sentiment "I haven't been everywhere, but it's on my list - Sontag". Our new and improved Mini TryFolds are clear stamp sets with dies that easily align to the image! The Pamper Your-Shelf MTF features a bookcase, bookshelf, reading mouse sitting on a stack of books, lamp and sentiments "You're a treasure" and "Pamper your-shelf". Includes two dies to cut out the openings, allowing for a sneak peek of your layered card. Instructions included. 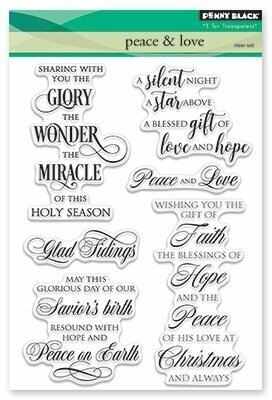 Christmas themed Penny Black clear stamps featuring the Christian sentiments "glad tidings", "sharing with you the glory, the wonder, the miracle of this holy season", "peace and love", and more! 18 clear stamps on a 4" x 6" storage sheet. 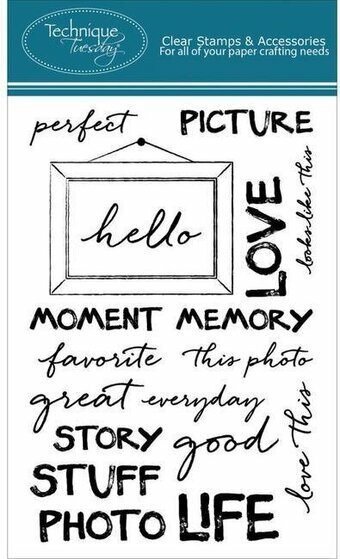 These photography themed clear stamps feature the phrases "Memory", "Story", "Stuff", "Photo", and more. Clear Stamp from Impression Obsession featuring the motivational sentiment "don't call it a dream, call it a plan." Clear stamps from Technique Tuesday featuring the inspirational sentiments "Live with intent", "Inhale confidence, exhale doubt", "Yes you can - end of story", "Be anything but predictable", and more. 10 clear stamps on a 2" x 4" storage sheet. Made in the USA using the highest-quality photopolymer. 13 Clear Stamps on a 2" x 4" storage sheet. Features the words "Priority", "Need", "Want", "My List", "Goals", and "Appt". Clear stamps from Memory Box featuring the sentiments "prayers", "thoughts", "and", "you are in my", "for a quick recovery", "sending you hugs and". 2 x 3 inch stamp set. 7 clear stamps included. "Have a purrfect day!" "I may be difficult, but I'm cute!" A message set to get you through the grayest days. Includes the sentiments "it is rain that grows flowers not thunder", "I love you rain or shine", "wishing you silver linings" and more! Clear stamps featuring "Reading Time", "In My Queue", "On My Shelf", "Subscribe", "New Release", "New Issue", and more. Hero Arts clear design stamps peel off their backing and stick to acrylic blocks for easy positioning. Mix and match the designs, then easily store them for another time. Made by us in the USA from genuine photopolymer. Unmatched quality means a crisp impression every time. 4x6 stamp set with 17 images! Saying hello to everyone has never been easier or cuter! Mix and match sentiments with the large hello to create the perfect greeting for any occasion. Hello = 5" x 1 3/4", All other sentiments = 1/4" tall. "Bird Brains" collection Art Impressions stamp featuring the funny sentiment "The early bird can have the worm I'll see you around noonish with a latte." Hero Arts' Art of the Card is a richly artistic themed collection. These cling sets, with silkscreened tops, radiate style and playfulness. They are deeply etched from top quality rubber for a lifetime of use. Includes 'Forgive and Forget", "Everything will be all right", "I'm here for you always", "Hello", "For You From Me", and "Sending you caring thoughts every day". 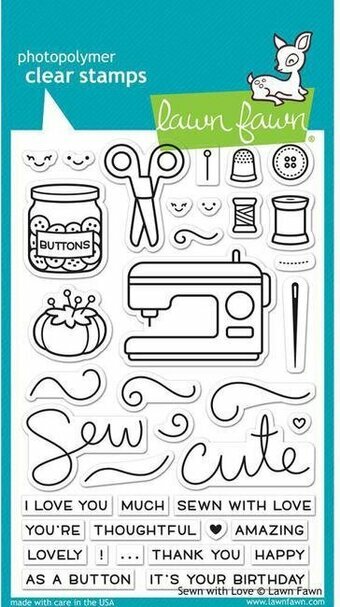 You will have sew much fun crafting with this stamp set! This is perfect for friends who love sewing, or for creating cards/tags to be given with a homemade (home sewn!) present. Create a simple card by stamping a sewing machine paired with the "I love you SEW much" sentiment. Add extra "thread" to the ends of the "sew" and "cute" sentiments, along with a needle to create words that look sewn. Add smiley faces to the objects for an extra cute touch! Approximate stamp sizes: [sewing machine] 1 7/8" x 1 3/8", [scissors] 1 1/4" x 1", [jar] 1" x 1 1/8", ["sew"] 1 1/2" x 1". Clear stamps featuring the sentiments "Love This", "Hello There", "Shine Bright", "You're A Gem", "Make Today Awesome", and more. Cling Stamps from Impression Obsession featuring "Cinderella is proof that a new pair of shoes can change your life". Clear stamps featuring the sentiments "Happy Birthday", "Shower you with love", "You make me sing in the shower", and more. Waffle Flower Crafts Clear Stamps. Ideal for cards, scrapbooks, stationary and other crafts! Position stamps on a clear acrylic block and stamp. Easily remove stamp from block and return to the transparent backer sheet when ready for storage.